Once popular with private homebuyers, indirect discounts like furniture vouchers and cash rebates have become less prevalent, reported The Business Times. In fact, only three percent of some 3,850 non-landed private homes sold by developers since 25 May had indirect discounts, with an average discount of 1.7 percent of the transacted price. The units were from 18 of the 132 projects that saw sales since 25 May, according to an analysis of developers’ new sales data. Notably, legislative amendments requiring developers to submit detailed transaction data to the Controller of Housing every week took effect on 25 May this year. The said data is then published by the Urban Redevelopment Authority (URA). Aside from the transacted prices of units, developers are also required to declare the value of benefits given to buyers, such as rental guarantees, cash rebates, furniture vouchers, and the absorption of legal fees or stamp duties, which would otherwise conceal the actual value of the units sold. “There was a season when discounts, rebates and other perks were dangled as carrots to attract buyers. However, these may be relatively passé today,” said Tan Tee Khoon, managing director of KF Property Network, a Knight Frank subsidiary. This is because developers may find it pointless to give out cash rebates now that such data has become public information, said Savills research head Alan Cheong., As such, developers who need to urgently clear their stock in order to meet the Additional Buyer’s Stamp Duty (ABSD) and Qualifying Certificate (QC) requirements are more likely to lower prices directly. The QC rule requires developers to pay extension fees for condominium units sold within two years of the project’s completion. Since December 2011, housing developers were also required to develop residential sites acquired and sell all the units within five years to qualify for an ABSD remission on land cost. Projects offering indirect discounts since May to qualify for the remission of ABSD include The Venue Residences, Jewel @ Buangkok, Pollen & Bleu and The Glades. Those unaffected by ABSD or QC include Keppel Land’s Corals at Keppel Bay, City Developments Ltd’s D’Nest and Coco Palms, and Far East Organization’s The Seawind. Sales in the Outside Central Region (OCR) made the greatest contribution to new home sales in August, according to an OrangeTee report. Sales in the OCR totalled 223 units making up 51.6 percent, while sales in Core Central Region (CCR) went down to 44 units and the Rest of Central Region (RCR) also dipped to 165 units, translating to 10.2 percent and 38.2 percent respectively. 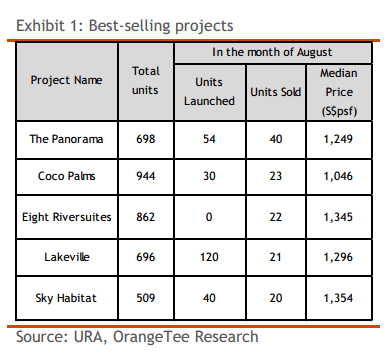 The report also noted the bestselling project in August was The Panorama , which sold 40 units out of 54 units launched at a median price of $ 1,249 psf. Located at Ang Mo Kio, the 698-unit residential project is developed by Wheelock Properties Singapore and will be ready in 2019. The project is near CHIJ St Nicholas’ Girls School and is a short walk away from the upcoming Mayflower MRT station on the Thomson-East Coast Line. Coco Palms in Pasir Ris was in second place, selling 23 units out of 30 units launched at a median price of $1,046 psf. “Noticeably, this development has seen quite decent monthly sales so far this year,” the report added. The 944-unit project by City Developments Limited is slated to be ready in 2019.